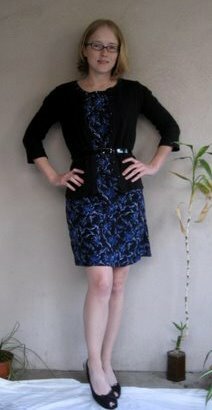 This was the first dress I refashioned from the newly discovered $1 Thursdays at Goodwill, when everything of a particular color tag is only a buck, and turns out it can go to the office as well as to the bar. Oh hey guess what tomorrow is: Thursday! Oh, but I’m going to a karaoke night at a new-to-me cowboy bar with some friends because “nobody has to work the next day”. (Oh hey guess who does have to work the next day.) Well, perhaps I can do both. Can’t hold me down. December 23, 2010. Tags: before & after, clothes, completed project, Goodwill, refashion, Target, What I Wore to Work Today. Pictures, Projects, What I Wore to Work Today, Words. December 23, 2010 at 8:02 am. Permalink.